Look up in the sky. 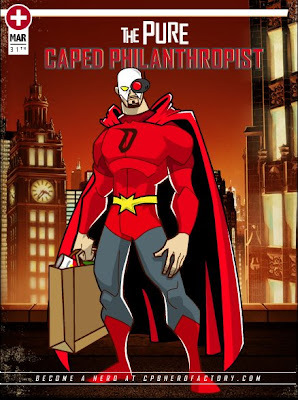 It's a bird, it's a plane, it's Super Dufus otherwise known as the Pure Caped Philanthropist! Yes that's right, a meek anonymous blogger by day but a modern-day super-hero Robin Hood, if you will, by night taking from the rich and redistributing to the poor (which these days is most of us). In these tough economic times, PCP's stimulus package consists of a bag of groceries from the food section of that upscale big-box trail blazer Wal-Mart : 4 boxes of macaroni and cheese Kraft Dinner, a pound and-a-half of bologna, a king size bag of Lays potato chips (I dare ya to eat just one) and a 2-4 of sports energy drinks to wash it all down. Nom-nom-nom. Hey, don't thank me - I'm just happy you know that Dufus delivers! Very cool. I put mine up on my blog sidebar, because I am just so proud of it. The Count does not know how you are able to handle this much excitement in your every day life,and return to such a trivial persuit as blogging at night. What is your secret? Mary: We philanthropists have to stick together! Count: I can blog in my sleep (as you may have noticed from the quality of my blog from time to time). Welcome to the League of Humor Bloggers dot com Super Heros!